1. 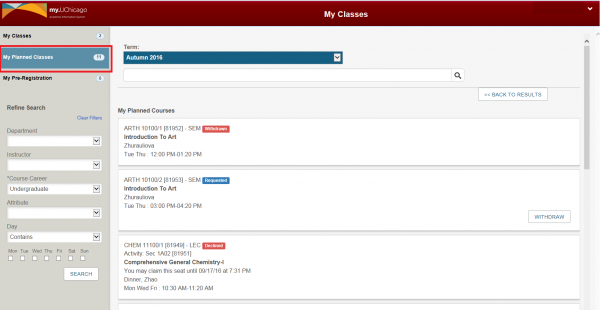 Click on the My Planned Classes tab on the left. Each course for which you’ve requested online consent will display. Approved The consent request has been approved by the instructor and you can register for the class. Claimed The class was successfully registered. Declined The consent request was approved, but you chose not to accept it and released the seat. Denied The instructor did not approve the consent request. Expired The consent request was approved more that 24hrs ago and the seat can no longer be claimed. Requested The consent request is awaiting approval from the instructor. Withdrawn The request for consent was withdrawn from the instructor’s queue and will no longer be considered for approval.